In recent years, interest in growing and preserving heirloom and antique varieties of fruits and vegetables has grown tremendously. Now, more than ever, gardeners are actively seeking to grow rare and unique plants from times past. One of the most exciting reasons for this revolution is to encourage diversity within garden plantings. Many fruit trees, such as the ‘Indian Blood’ peach, are excellent examples of old-time favorites being reintroduced to a new generation of gardeners. Read on to learn more about growing Indian Blood peaches. What are Indian Blood Peach Trees? Introduced to Mexico by the Spanish, Indian Blood peaches quickly became a cultivated crop for many Native American tribes. Treasured for their high yields, this gorgeous deep red-fleshed peach is crisp and perfect for use in canning, fresh eating, and pickling. Additionally, its hardiness and disease resistance made this variety of peach tree a staple in home orchards for decades. Over time, the commercialization of fruit production has caused this cultivar to become somewhat of a rarity. Like many fruit trees, these peach trees have several requirements in order to thrive. Indian Blood peaches are listed to require at least 750-900 chill hours in order to produce fruit. This requirement makes the plants hardy to USDA zones 4-8. Since these peaches are listed as self-fruitful, their planting does not require an additional pollinator plant. 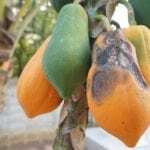 However, it is suggested that plants are able to better produce an abundant Indian Blood peach harvest when a compatible pollinator tree has been planted nearby. The first step to growing this type of peach is to locate young saplings. Due to the popularity of new cultivars, it may be unlikely that growers will be able to find this plant available at local nurseries and garden centers. 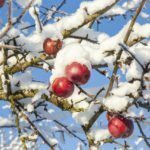 Luckily, these fruit trees can be found frequently through online plant sellers. When ordering, purchasing only from reputable sources will ensure the best chance of receiving a healthy and disease-free peach tree. Choose a well-draining planting location in direct sunlight. Soak the roots of the peach tree sapling in water for a few hours before planting. Dig a hole about twice as large and as deep as the root ball of the plant. Fill the planting hole with soil and cover the roots, being careful not to cover the crown of the tree. To maintain the tree, follow proper pruning procedures each season to regulate the growth of the plant and it fruit production.